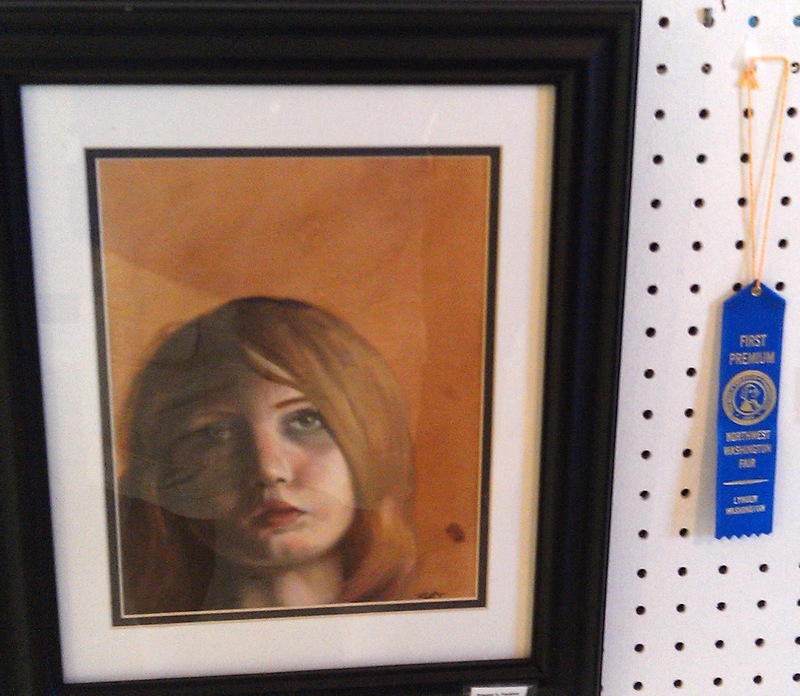 From about the fifth to the ninth grades, the Washington County Fair was one of the highlights of the year. What's not to like: first a parade, then Friday afternoon out of school with special prices on the midway rides. At that age, I didn't feel any necessity to go through the various building containing horses, pigs, cows, chickens, preserved vegetables, "art work", Four-H exhibits, politicians, civic groups, etc. The focus was on spending my $5 allowance to maximize assaults on the stomach by rides, food, and drink. I would waste a few dimes on desultory efforts to knock down some bottles to win a big stuffed animal, but I was pretty fatalistic about the results, knowing with a high degree of probability that I would not win. Also, I was willing to shell out a few dimes to see the alligator woman, snake man, and other oddities that did not appear every day on the square in Fayetteville. The day was a success if I had a go on the most scary rides and escaped without throwing up. When my $5 was done, the day was over with nothing but good memories to tide me over until the next year. 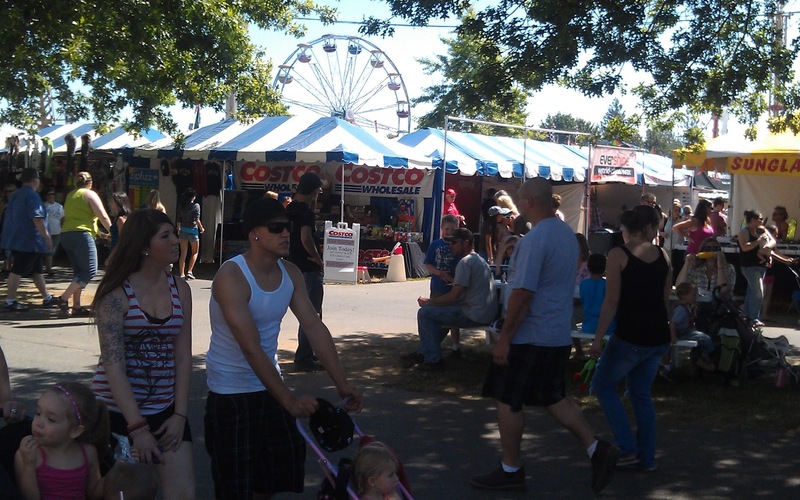 The Northwest Washington Fair is a major happening in this extreme Northwest corner of the U.S. with a packed schedule of shows, plus huge exhibit areas. It has a medium size midway, with a few rides that look stomach challenging. The food booths are all around with all of the usual fried stuff for which fairs are now famous. 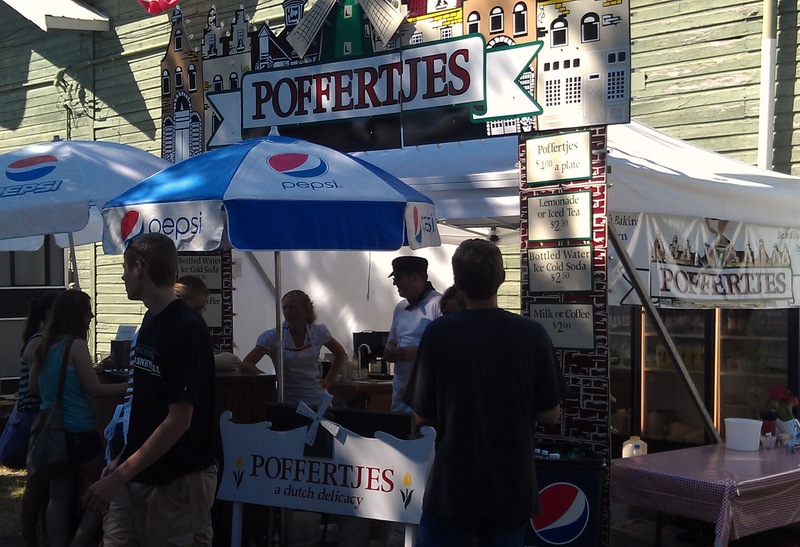 Because Lynden either has, or pretends to have, a strong connection to a Dutch heritage, one booth offered what is purported to be a Dutch sweet treat that seemed, a first glance, like fried donut holes, but are, in fact, a bit more sophisticated dumpling-type food. They are called Poffertjes, and they are not deep fried, but are cooked on a special stove top contraption. They are quite popular: every time we passed the stand, a several people were waiting in line for their plate full of them. 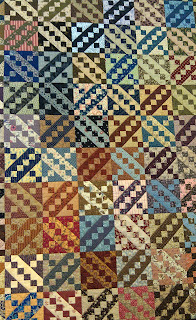 I enjoyed the exhibitions, and was most impressed with the quilts. They were put together with the help of sewing machines, but still were impressive for all the work that went into them. 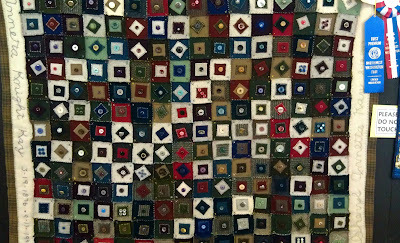 My favorites were a small multi-colored quilt made out of many small squares, each of which had an old button in the middle (see above). 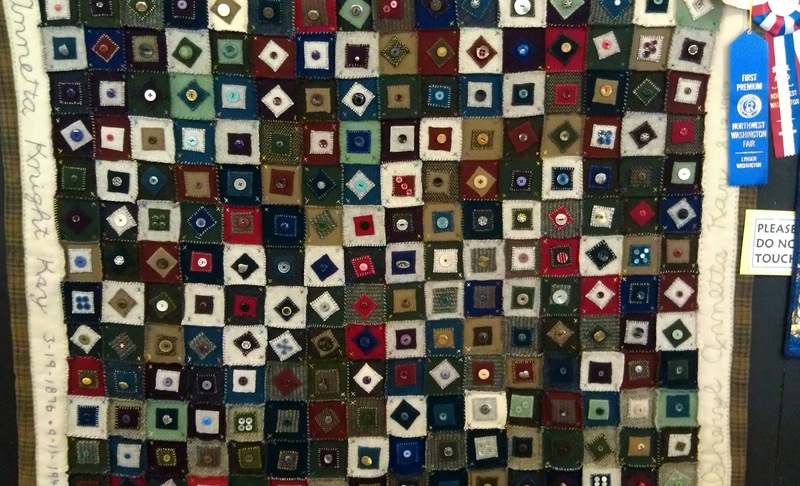 The quilt also had names stitched on its edges, along with birth and death dates. Another favorite (to the left) had great colors and a strong pattern. 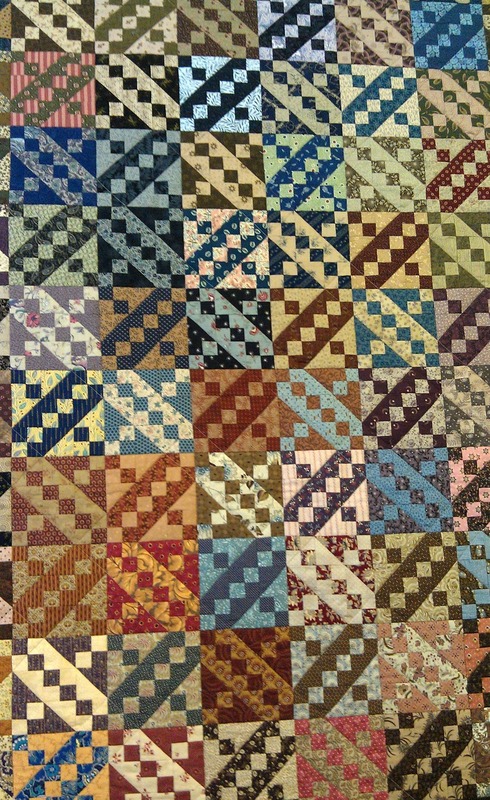 It also was made out of small squares sewed together, creating multi-color lines crossing from corner to corner. We also took some time to look at the photography and art work. It was not too impressive, but had some pieces that were enjoyable. 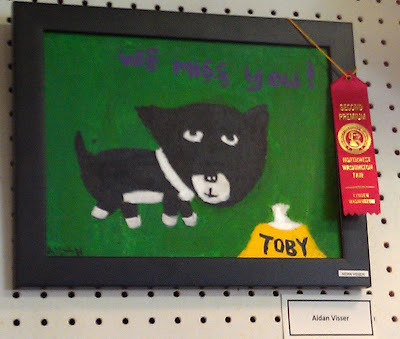 Natalia and I both liked a bold painting in the 9-years-old-and under category. Also, we were impressed by a portrait painted by a teenager (see both below). Isn't this cow's udder about to explode? We skipped the horses, pigs, and ponies, but looked at the flower, vegetable, and food exhibits. 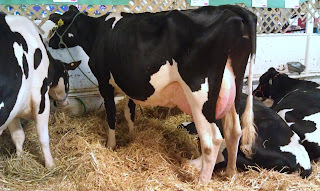 Most were looking pitiful on this fifth day of the fair. But not the pies, which I observed at length with a watering mouth. After dutifully looking at the exhibits and walking briefly around the midway, we decided it was time for the Poffertjes. So, we took our place in line. As we waited, we watched them being cooked. The cooks prepared a pancake-type batter and poured it into dozens of egg-shaped indentations on a stove top. After a few minutes, the cooks used a straight piece of wire to flip the Poffertjes, like turning over pancakes, to cook the top side. In about four to five minutes, the nuggets were done, dusted with some sugar and served on a paper plate with a dollop of butter. They were worth the wait. Long live the Dutch! After downing the treats, we walked to the exit, passing a small outdoor theater where a hypnotist was beginning her show. She was asking for people to volunteer to be hypnotized, and Natalia wanted to volunteer. I am sure that she had only a professional interest in doing that: She is a psychologist, and maybe she could get some tips on how to use this technique. I convinced Natalia that I was about to pass out from the heat (it was up to the middle 70's!) and marching around, so she followed me out the exit. 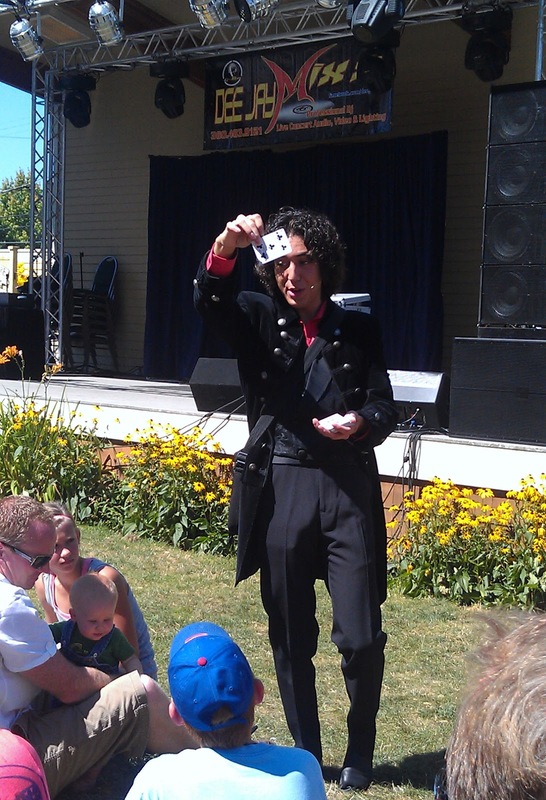 Quite a nice day, even if I didn't get to see the hypnotist make Natalia cluck like an Uzhgorod chicken!